The Zero Graffiti International Conference: At Odds with Long Term Solutions? HomeThe Zero Graffiti International Conference: At Odds with Long Term Solutions? A vandalized Zero Graffiti Conference Poster. Evidence of a serious need or ineffectiveness? $17 Billion is spent annually on graffiti abatement. Bad news for property owners. Good news for the industry. 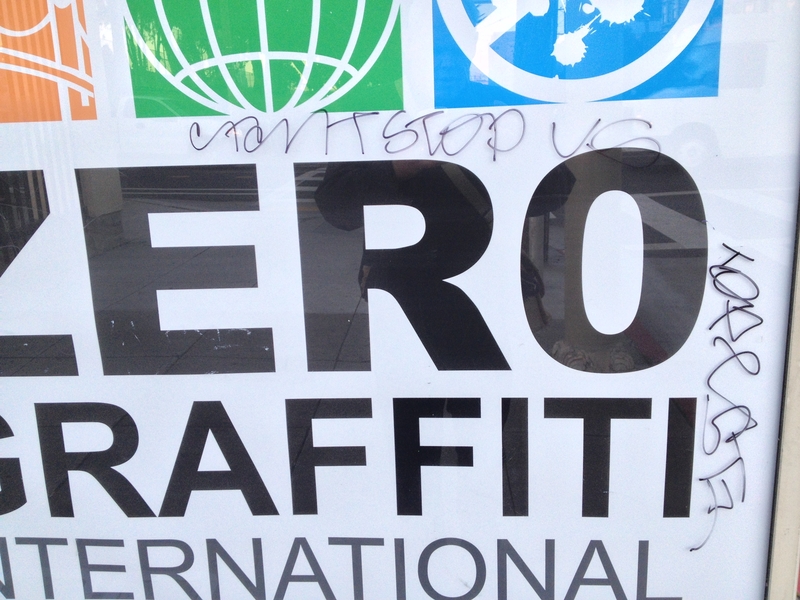 The First Annual Zero Graffiti International Conference was held in San Francisco last week. Hundreds of police officers, public works officials, “graffiti” consultants, and industry reps from 52 cities gathered as the industry that has grown up around abatement announced that it had made $17 billion in profit in the United State alone. Despite the massive expenditure, no study has been undertaken to measure the effectiveness of simple abatement on vandalism recidivism. San Francisco alone spends $20 – 30 million each year in painting out the writing on the wall. Mohammed Nuru, director of San Francisco’s department of public works, claimed that judges were too lenient with vandalism offenders. Oakland appears to agree, passing an “anti-vandalism” ordinance that stiffens penalties on people caught doing graffiti, as well as penalizing property owners for leaving the writing on their walls too long. Nuru compared vandalism to murder and domestic violence, implying that perpetrators should be sentenced accordingly. But are stiffer penalties really the best solution? In 1982, during the midst of New York’s aerosol explosion, Mayor Ed Koch declared that a repeat offender should be given 3 days in jail. In 2012, vandals caught in San Jose were given up to 8 years, four times the minimum for manslaughter. The massive increase of almost 100,000% in sentencing over the past 30 years appears to have had little impact. At the same time, the abatement industry has also grown exponentially, with an influx of “graffiti consultants” and new products for capturing vandals and removing paint. Urban blight has grown into big business, which has led to the creation of First Annual Zero Graffiti International Conference in order for experts in the field to share strategies and compare notes. Thus, left out of the conversation was any serious discussion of long-term solutions such as community based mural programs. While Lindner conceded that aerosol aesthetics “can be wonderful,” there was no discussion of working with aerosol muralists to permanently cover up the highest blight areas in our communities. Beautification programs like the Community Rejuvenation Project were told that if they did attend, they would not be given any opportunity to make statements and would not be allowed to pass out any materials. CRP reiterated its public stance at the Oakland City Council meeting on Tuesday. With the toughening of the penalties for vandalism, equal emphasis needs to be given to mural programs for the youth both as a preventative and diversionary program to keep children out of the juvenile justice system, as well as a tool for re-entry. A portion of the penalties assessed from vandalism convictions should be used for arts programs and mural diversion programs should be funded in the next two-year budget presented by the City Council. The City Council has made a commitment to restorative justice in its latest ordinance but it has yet to but its money where its mouth is. God forbid any facts should get in the way of this article. One of the few correct statements was there was a conference in San Francisco. It’s always a good idea to check and report facts as opposed to taking bits of information and twist them falsely for your own agenda. Graffiti without permission is vandalism plain and simple. Care to expand on which facts were incorrect and/or twisted?